Monet is one of the main adherents of impressionism. His paintings laid the foundations of modern art and revolutionized further European painting. 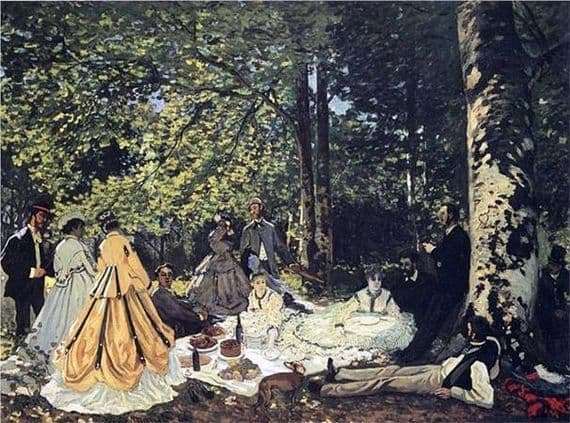 “Breakfast on the grass” is a kind of manifesto in support of the picture of the same name by Edward Manet, which in 1863 produced a real scandal in the framework of the Salon of the Miserable. This picture depicted a naked woman surrounded by dressed men – an unheard of audacity for those times. In 1865, Claude Monet began work on his own version of the painting Breakfast on the Grass. The canvas is thought to be huge – 6×4.6 m.
At first, the artist performs etudes and small sketches in the Fontainebleau forest, and then separately in the workshop draws male and female models (for which his future wife Camilla Donsier posed). Later, the artist harmoniously assembles everything, fitting the models into the landscape. The picture “Breakfast on the Grass” is a collection of elegant men and women who picnic in nature in the shade of ancient trees. From the heart carved on the bark of one of them, one can judge in which romantic mood Monet created this masterpiece. The picture is built on the principles of light and shade. The sun’s rays pierce the entire canvas of the artist and stream through the foliage of the trees. Monet desperately searched for the light and literally filled them with his entire picture, the sun’s rays gently fall on various fragments of the picture – the fabric on the dresses of the ladies, patches of grass or human skin. Unfortunately, the canvas was never finished by the artist and in 1878, Monet left it as a security deposit for the housing of the hotel owner. Many years later, the artist is trying to modify the forgotten masterpiece, but some of its sections are heavily damaged by moisture, Therefore, Monet simply cuts off the unnecessary and only fragments remain from the fundamental concept, which are now kept in the Louvre, and the sketch of the painting in full size – in the GMMI them. Pushkin in Moscow. Only thanks to these surviving bits, the descendants of the French impressionist can today admire his God-given talent.